Order up. Cochinillo Asado ready to go. The tag on the ear – Authentic suckling pig. 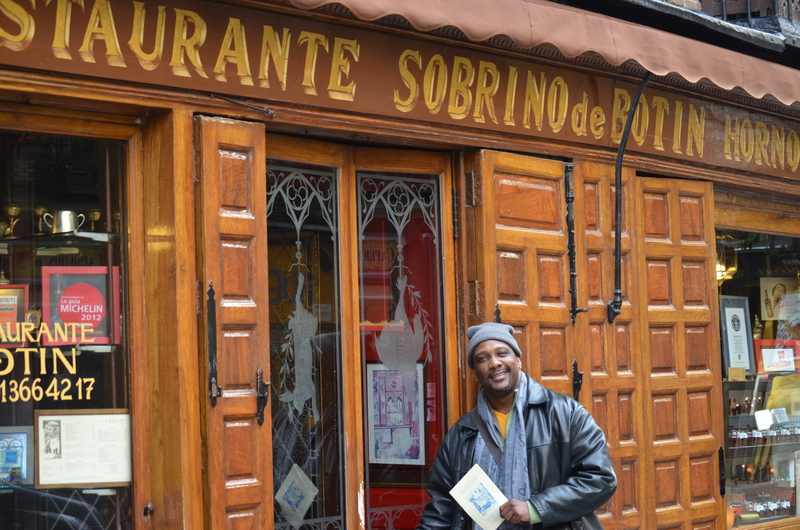 The tour guide organized a tour of the facilities in El Botin, oldest working restaurant located in Madrid, Spain for me the chef…I’m blushing like pink sea salt. I met chefs going about their morning business prepping for the start of lunch service. I feel as if I’m in a candy store tagged with bundled energy, I miss that sometimes. 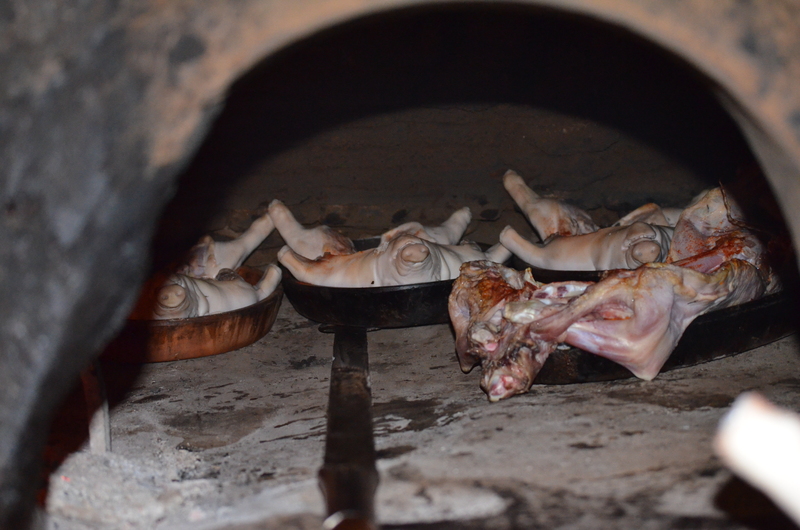 In this epicenter, pots are boiling, oven doors are clanking, meat is getting butchered, vegetables being peeled, monk fish is being expertly fabricated…and oh yes, suckling pigs are getting seasoned and roasted. Roasted in an oven that has been lit and operating since 1725 having never been extinguished… I touched the worn granite, it was so surreal. 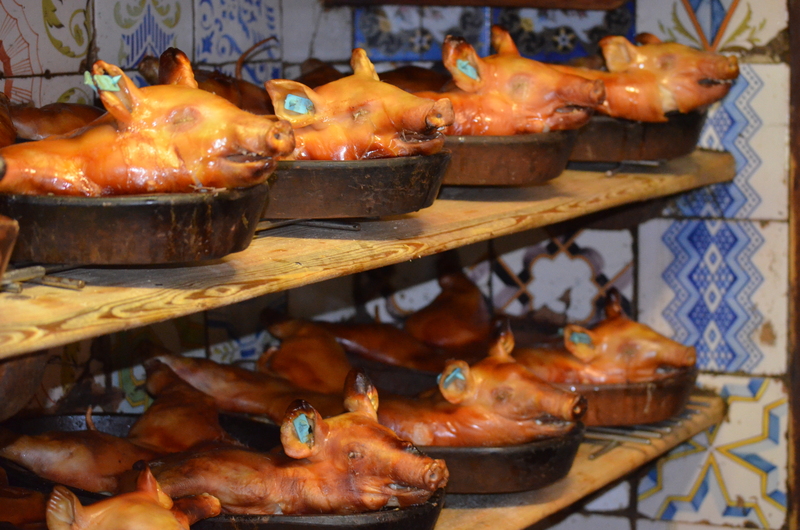 In this kitchen and in Spain the pig is king. 50 -60 suckling pigs get roasted here daily. The little 35 pounders each take about 2 – 3 hours to get done. Seasoned simply with Thyme, Bay leaf, olive oil, tomatoes, garlic, salt and Spanish Paprika – prepared so differently than in Jose Maria in Segovia, Spain. No authentic suckling pig seal on the ears of every pig, it doesn’t get purchased. 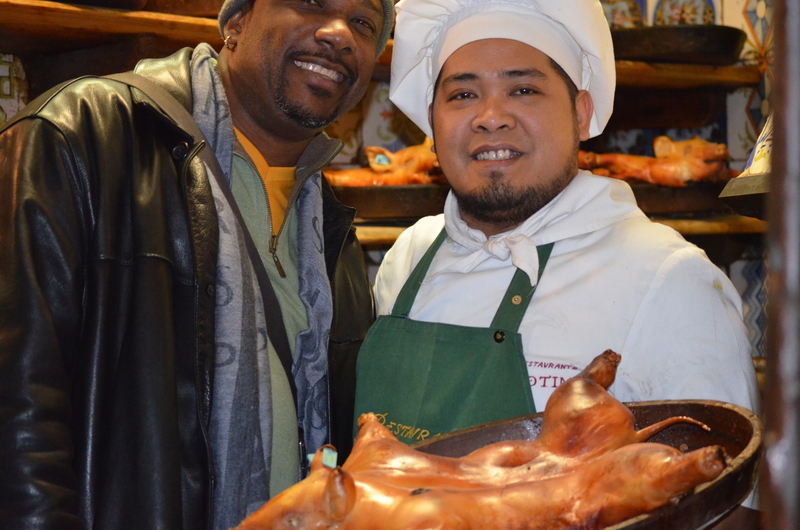 I chatted a bit with Chef Michael, a Filipino national that has worked at El Botin now for 10 years, roasting suckling pigs. With that smile, I know he enjoys his work. 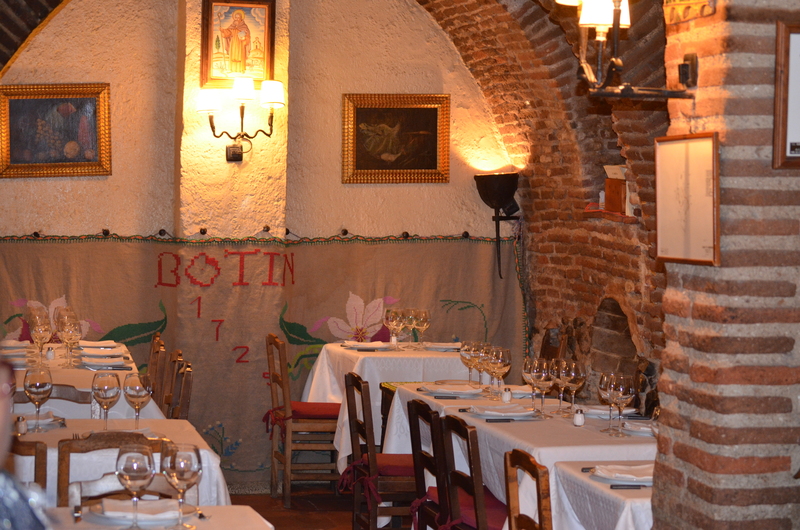 El Botin is a charming place with multilevel dining rooms, both above and below the kitchen. This was the favorite restaurant for Earnest Hemingway as he mentions in his book “The Sun also rises”. They said he wrote that novel while dining there at the restaurant. 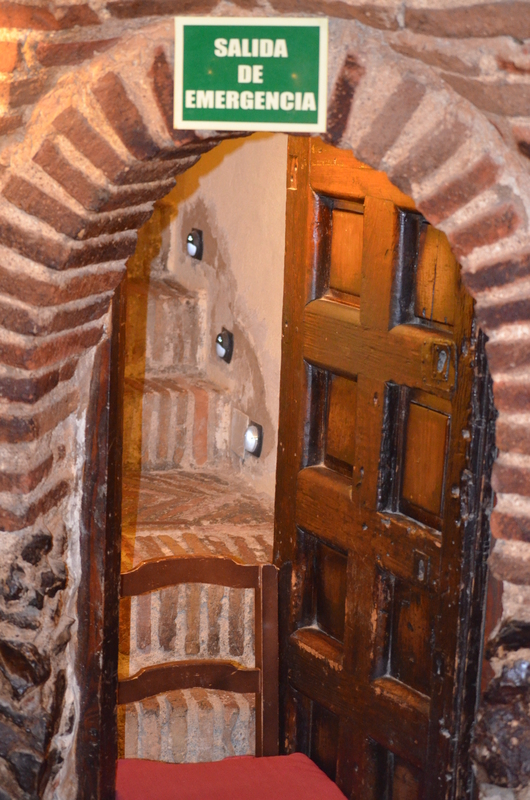 The building is even more fascinating when you understand that the many hallways, rooms, hidden stairways were used not just means of egress but were used to hide people during perilous times. 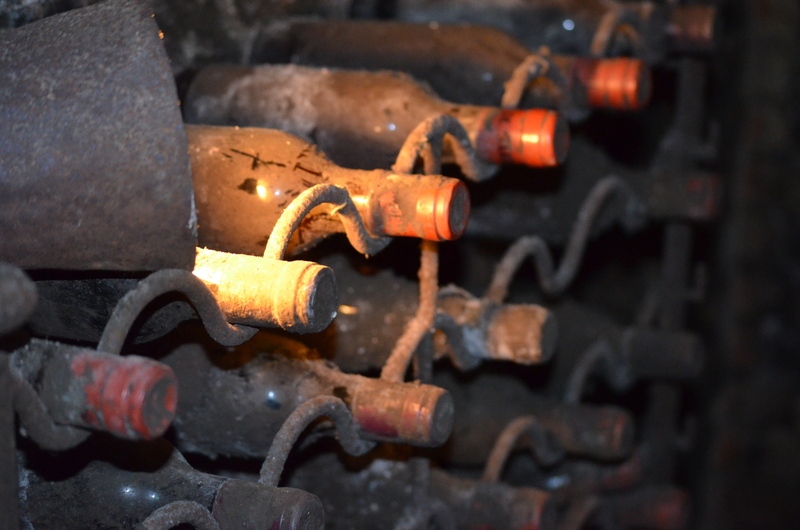 One of which lead down to a wine cellar housing priceless bottles of wines. The dust was so thick on some I was expecting Christ to come out and pour me a drink. Of course you know I had to take a closer look. Squeezing my way between racks of wines. 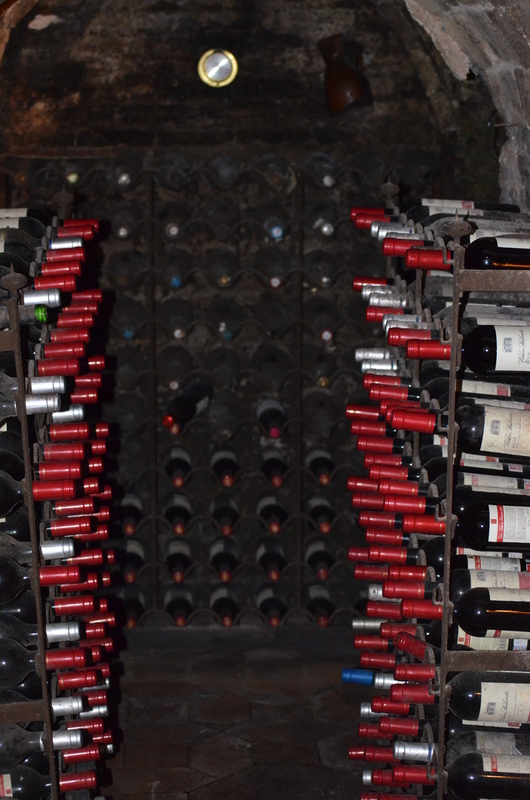 Upon leaving this cellar I began to think of the craziness of what I just did. Break a bottle and I might still be in Spain roasting suckling pigs to pay my debt. Hey, no risk no glory. I enjoyed this tour because as a chef it truly allowed me to feel connected to Spain. I never got to try the pig there but maybe they can ship me one of these little suckers. Food on Fiyah!!! Rows of wine that I walked through. Clearance – less than 3ft. 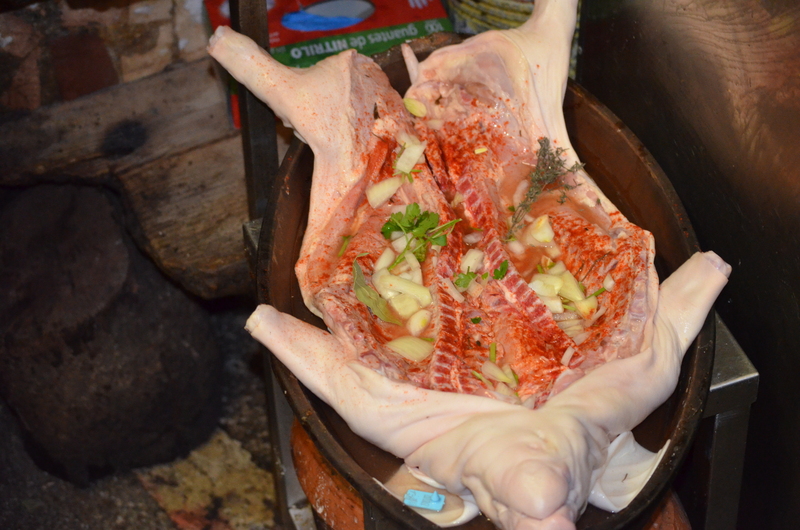 This entry was posted in foods from Spain and tagged cochinillo asado, El Botin, Ernest Hemingway, Madrid. Spain, suckling pigs. Bookmark the permalink.